I had the special pleasure of sitting across the room from Becky Ashenden in her New England country home for a personal conversation. After spending five days as a student in her Vävstuga Classics class, I was eager to learn more about this fascinating woman. I hope you can hear Becky’s cheerful enthusiasm. As you read, please imagine Becky’s smiles and laughter gracing our pleasant time together. 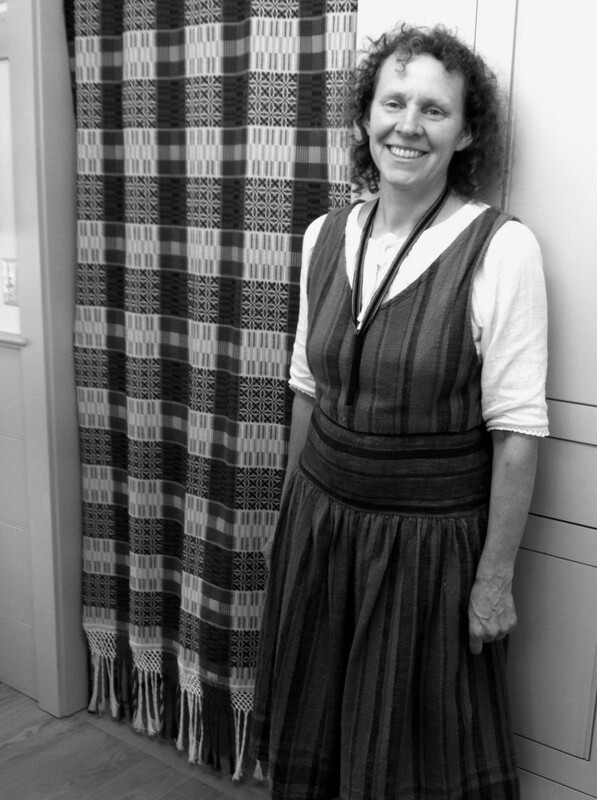 Becky Ashenden wears her handwoven dress and her smile, ready for another full day of teaching. Becky also wove the curtain hanging beside her, of course. This first part of the conversation discusses Becky’s perspective of handweaving, including her training in Sweden. The second part, coming in my post later this week, continues the conversation by exploring Becky’s teaching philosophy and some new adventures she sees on the horizon. Autumn morning view from the students’ quarters upstairs at Vävstuga Weaving School. Where do you find the most enjoyment in weaving? The way I usually answer that question is that my favorite thing to weave is whatever I’m doing at the moment, as long as it’s going well (chuckle). You have spent a lot of time at the loom, haven’t you? I’ve done so much production. There’s something about doing production that’s pretty boring; but it’s also pretty mesmerizing. If it’s plain weave and you’re just going, going, it’s a physical enjoyment. And with a bigger loom with ten shafts and ten treadles, if it’s going rhythmically, it’s a very physical enjoyment. If there’s something that you have to concentrate on, it’s a mental enjoyment, as well as the physical enjoyment. I really like the variety. And I’ve always done a lot of variety. So, sometimes just two treadles is really fun after ten treadles; and doing something delicate is really fun after doing something really raucous. It seems like you enjoy a challenge, and the discovery of finding solutions. That always makes it interesting, yes. I definitely enjoy a challenge–like rearranging heddles if I have to change the threading (laughter). Problem solving is something I’ve always loved. And one aspect of weaving that I enjoy, too, is taking a project off, seeing the empty beam, putting all the tools away, messing with the tools. I love messing with the tools. I love doing the tie-ups. I love messing around with the equipment! You sound passionate about enjoying the process! That wooden equipment, and every little stick and string being in its place, and seeing a newly beamed warp–the processes of it! And the magic-ness of turning thread into fabric. I really enjoy the whole process and the huge variety that there is. Something I’ve always felt, even from a young age, is that when I get bored with one kind of thing in weaving, there’s more than a life’s worth of other things to explore, so I’m never going to run out of things to explore. And I remember thinking, “Some of the little fussy things that I don’t like when I’m young, maybe I’ll like when I’m older,” and I find that I do. So there’s just endless, endless variety, and I love sharing it with others. That’s certainly one of my greatest joys–sharing that enthusiasm that I have with others. It’s the whole process, and it’s the tools, and it’s having the tools arranged in the studio a certain way. 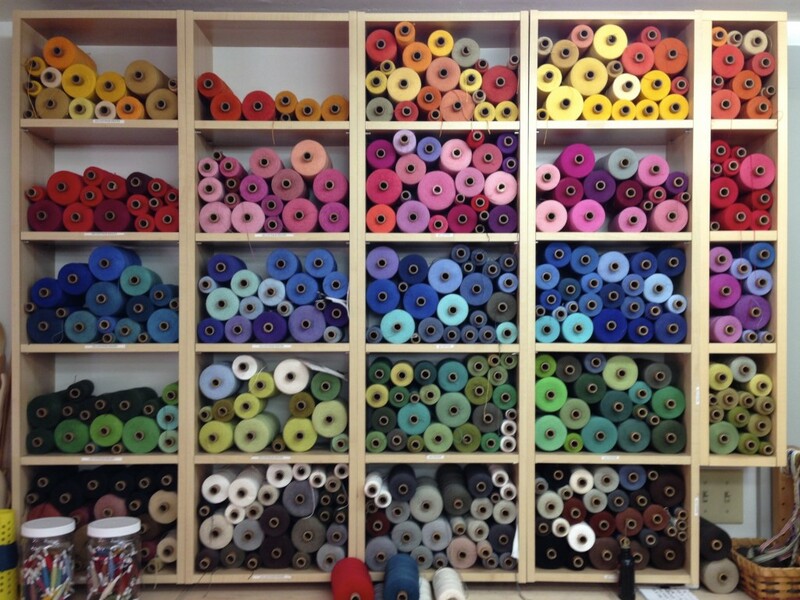 What else is important to you in the weaving process? Using the things afterwards, and showing other people how to use them. Not just putting them in a drawer, but having a different table setting three times a day (chuckle). That’s definitely part of the enjoyment, too. Why do it otherwise? You spend all this time making something beautiful; and the things are meant to be part of daily life–not just special occasions, but daily life. 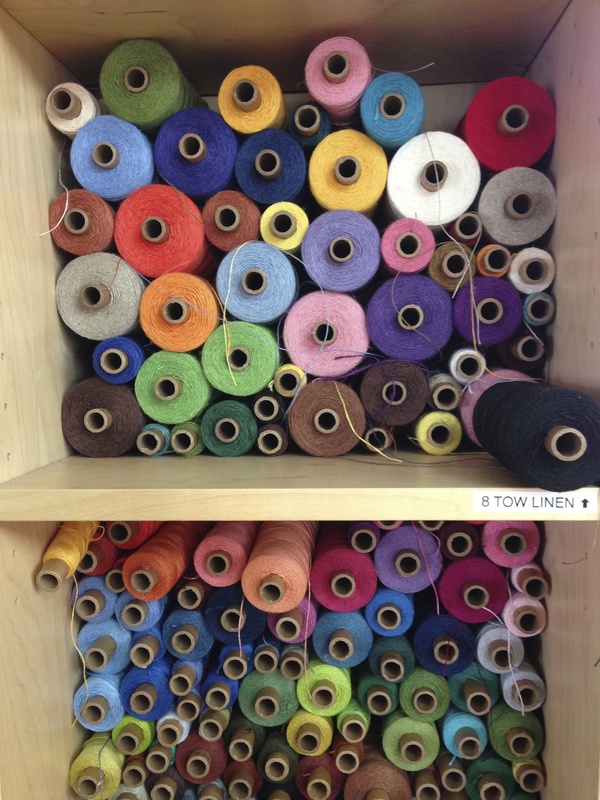 Is there something that sets your teaching approach apart from other weaving instructors? Being trained at the school that I was trained at, Sätergläntan Hemslöjdens Gård. I really, really appreciated how I was taught to weave, and especially in Sweden. Sweden was a place where they had preserved a tremendous amount of their handweaving tradition, which really is a tradition that exists all over the world in its various ways. In many places, the industrial revolution made things easier for people’s lives at home. They didn’t have to do all this grueling labor to produce all the fabric they needed; and it was a blessing for them to be able to buy fabric. It does not take very long, though, once the industrial revolution comes through, to lose all the old hand skills that have been developed over centuries and centuries. You can’t just get it back. Sometimes you have to reinvent, and it’s not the same as this centuries-old knowledge that’s been handed down. So, how did people in Sweden manage to preserve these traditions and skills? In Sweden there was an organized effort to preserve the tradition, because they said that, while this was getting lost in some places, “We don’t want this to get lost.” There were people that were real movers and shakers who set up schools. They decided to teach weaving to potential teachers. So, even in the 1920’s, or so, there were many handweaving teachers that were professionally trained, with an eye towards keeping this tradition alive. They were all trained in the same way. So, it’s very consistent. Consistent approach, consistent equipment. It was a whole package that went together really well. Very, very well thought out, and very well developed. And that’s what I was taught. I was taught a complete package of handweaving, beginning to end, with all the same equipment, same approach, same tradition. I think that is different from what a lot of teachers in this country (USA) have available to them. So, I had this training that comes from way, way back. It’s such an honor to have been trained that way, and to put it into practice for so many years. I feel that I really do have something to offer that is different from other teachers. …Maybe not so different from what is offered to people in Sweden. 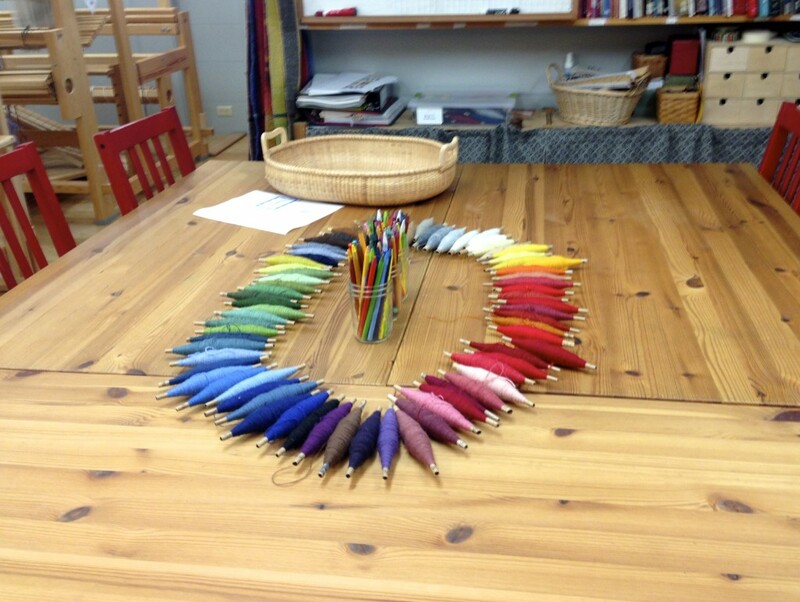 How would you describe the type of weaving instruction that you offer? I think that what I offer here at Vävstuga is a little bit more traditional; and, perhaps in some places in Sweden they might say “old-fashioned.” There are a lot of wonderful artists in Sweden that are very contemporary. They’re well-trained, and they do amazing beautiful contemporary work, which isn’t what I do. 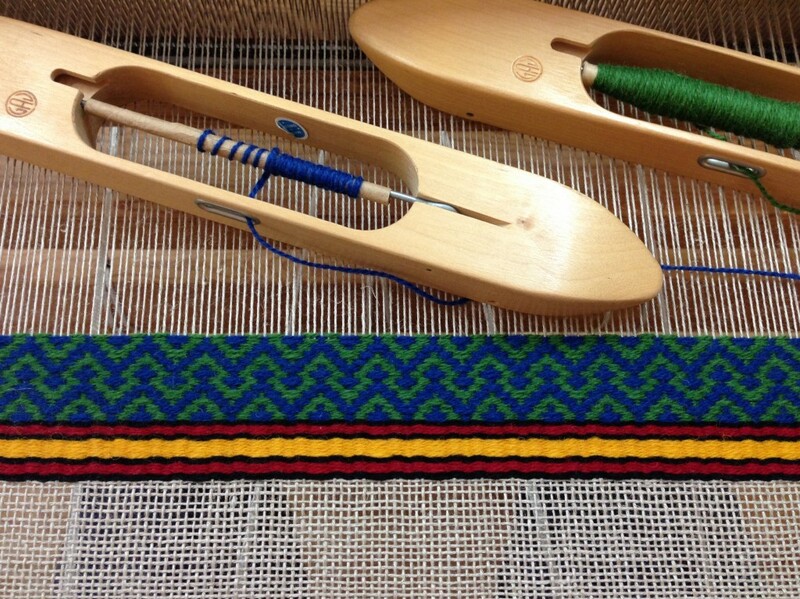 I’m so attracted to the old-fashioned traditional weaving. And it seems that other people are attracted to it as well, enough to come to do what I have to offer. May you integrate laughter into your conversations. Cotton, linen, wool. Thick, thin, slick, rough, smooth, bumpy. 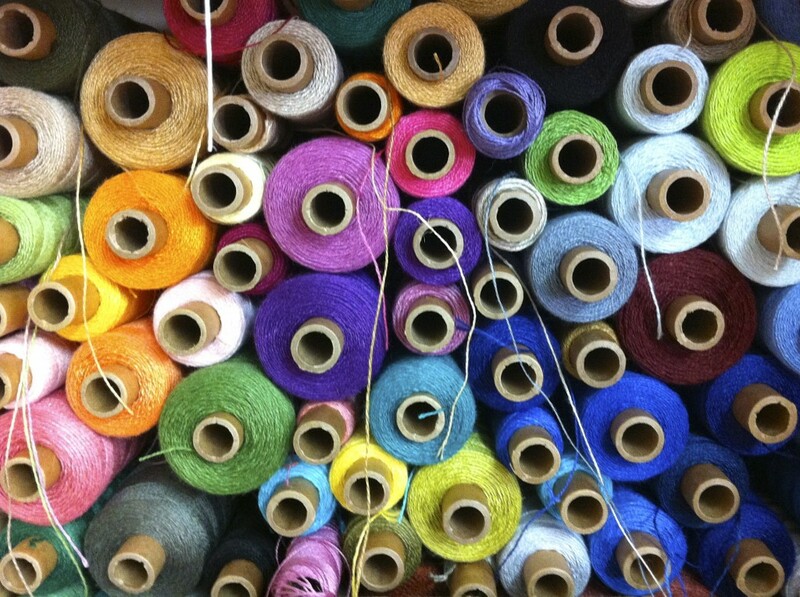 Yarn comes in so many shapes and sizes. But, oh, it’s the colors that draw me in. 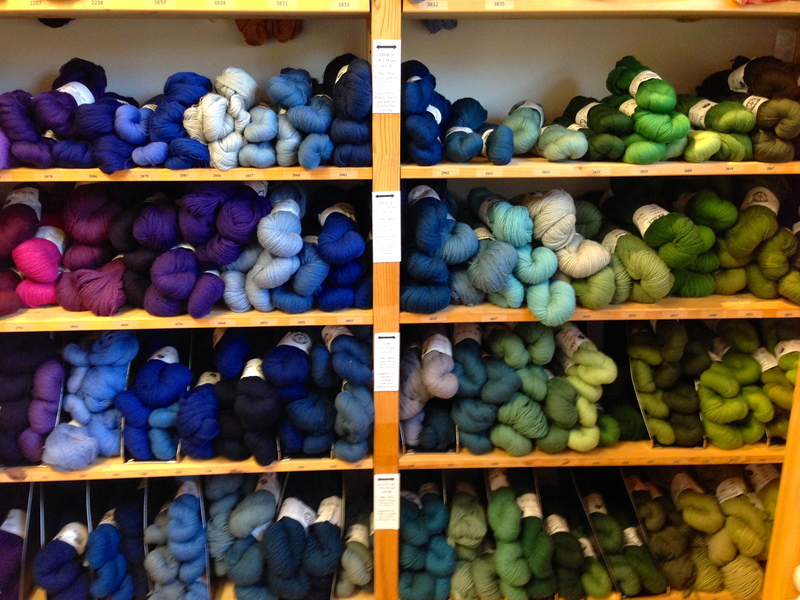 I love a wall of yarn! I don’t need to have it all, I just want to look at it. Thread on tubes looks spectacular, piled up in cubbies. Yarn in skeins looks inviting. 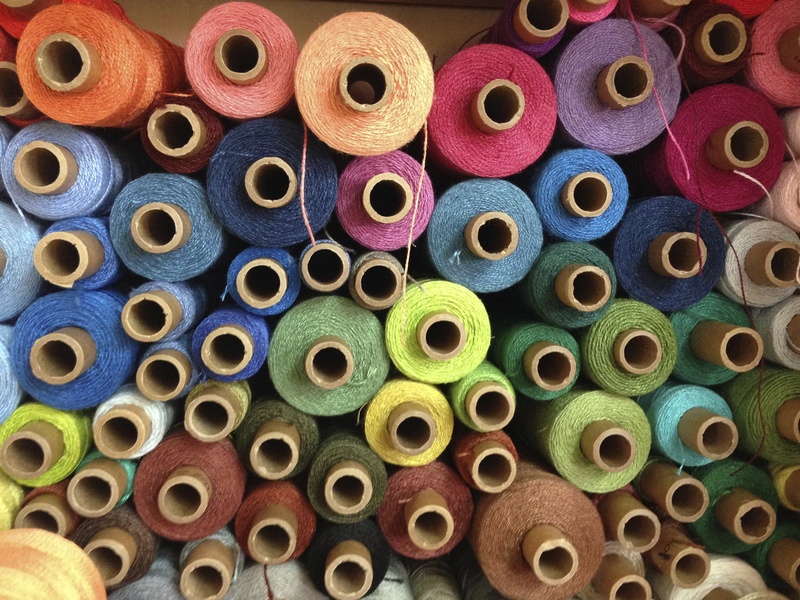 Yarn, thread, fiber… Whatever you want to call it, may I have just a little more, please? I love the circles of colors and the “O’s” of the tubes! It’s as if they all have their little mouths open. Class time at Vävstuga often means playing with colors. Decisions, decisions… Which linen color would you choose? 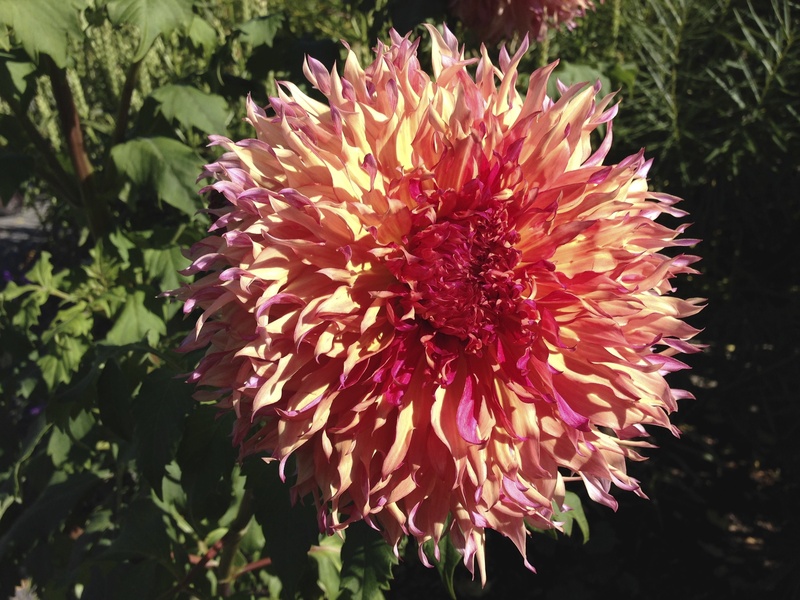 Dahlia on the Bridge of Flowers, just outside the Vävstuga weaving studio. Cotton, anyone? This is a fun wall of color! It is the backdrop to the table where we wind our quills at Vävstuga. 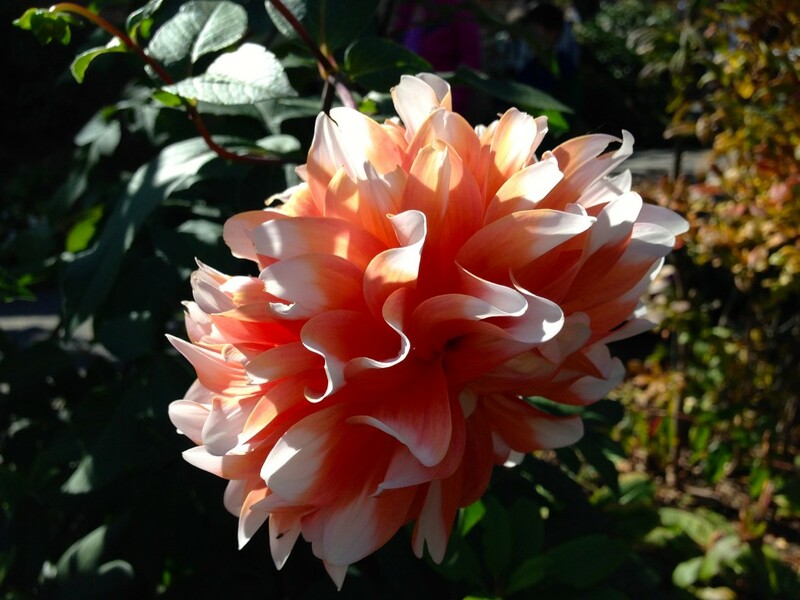 Another Dahlia that caught my attention! I like the raggedy edges. Imagine blending yarn in these colors. Yarn on skeins will be wound into balls to be prepared for weaving. What can I say? I never get tired of seeing the thread color circles! Please come back next week for the lively conversation I had with Swedish weaving expert and founder of Vävstuga Weaving School, Becky Ashenden, in her living room. Find out what makes her tick! May your days be filled with color! 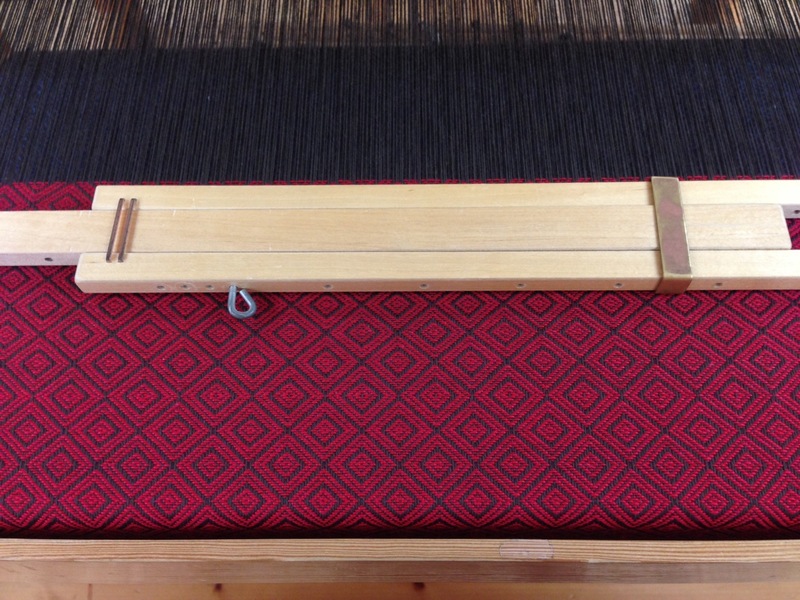 This Swedish rosepath is a weft-faced structure, which means the warp is covered by the weft. (To see more of what I wove during my week at Vävstuga Classics, click HERE and HERE.) 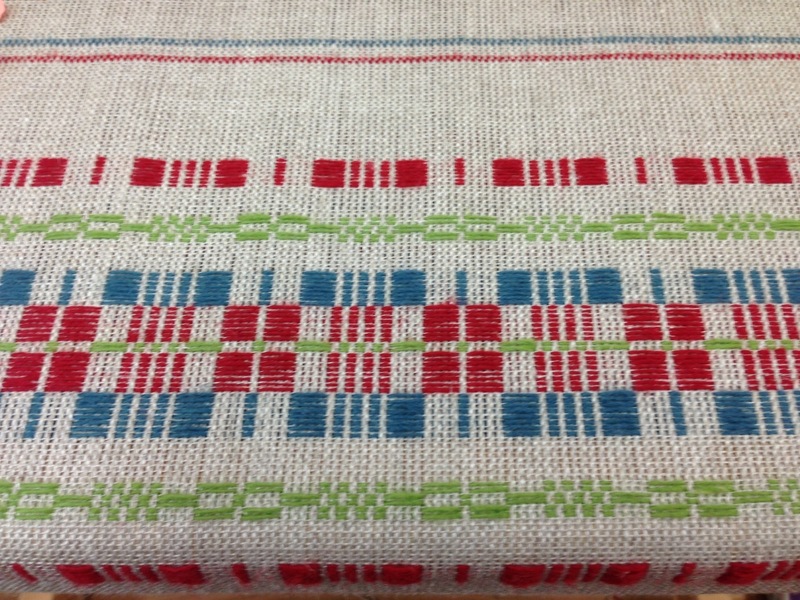 Yes, you can see this linen warp preceding and following the woven wool weft, but if you look at just the patterned area, the warp is not visible. 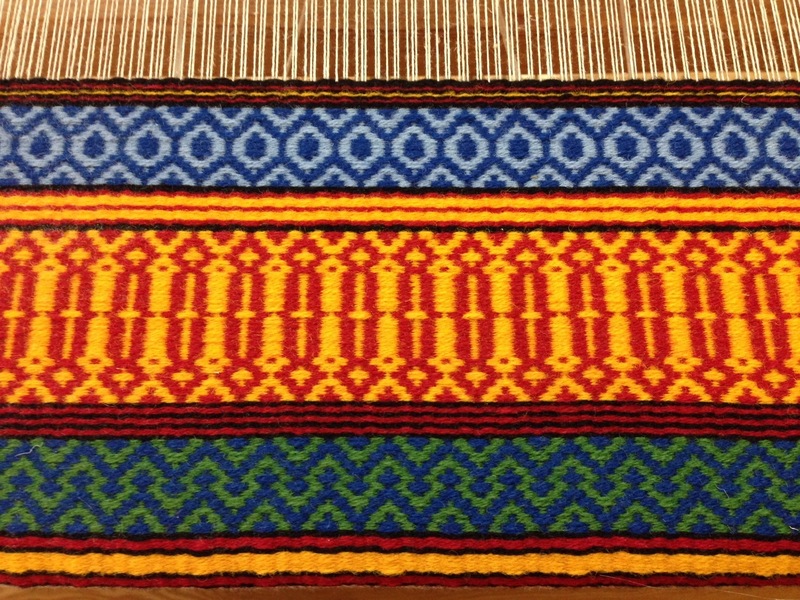 The treadling is simple (weaving on opposites); and because of many possibilities with pattern and color, designing at the loom is incredibly fun! Do you ever think about the warp that lies under the pattern and color of your life? 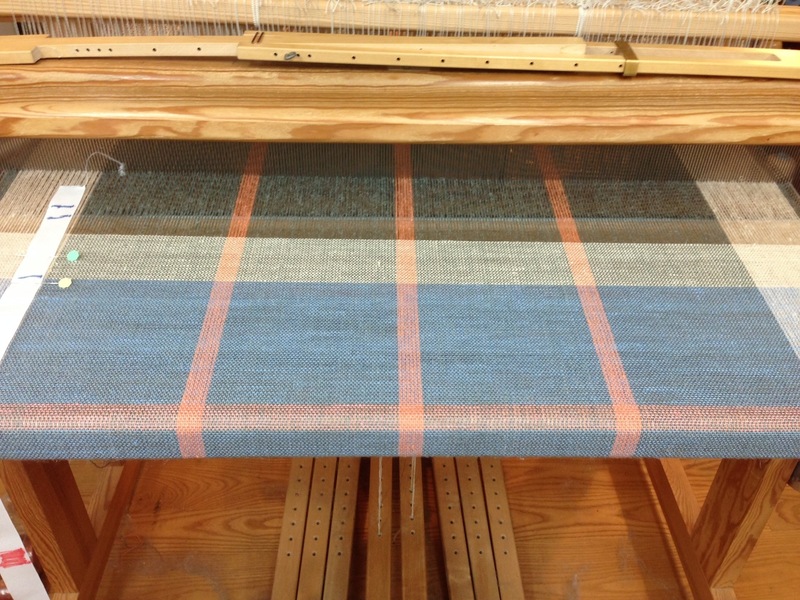 Warp is 16/3 Line Linen (Bockens) and weft is Brage Wool Yarn (Borgs). Treadle one is paired with treadle three, and treadle two is paired with treadle four. 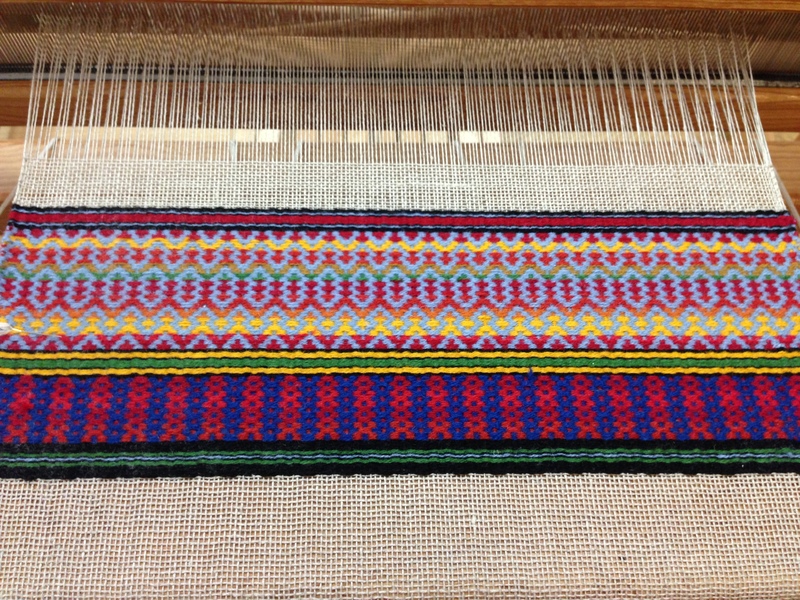 This simple treadling, combined with color choices, provides endless design possibilities. At times I find myself so involved in my day-to-day activities that I only think about what needs to get done, forgetting the unseen warp that provides the inner strength I need. Inspired by New England’s autumn foliage, this piece is an attempt to capture the glory on display in creation. Our creator’s goodness is so constant we can overlook it, forgetting how much we need his goodness to sustain our lives. And it is his unending love that gives meaning and stability to the overlaying patterns and colors that form our days. You do not have to see the warp with your eyes to know it is hidden within the beautiful rosepath weaving. 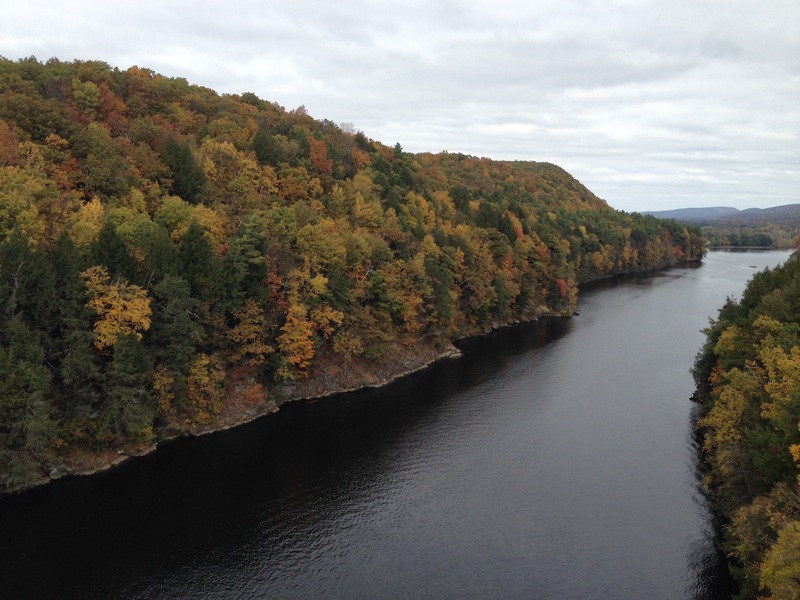 The scenic autumn New England countryside that I enjoyed last week is the creator’s rosepath on display! May you discover hidden things worth discovering. Scheduled days filled with laughter, intense concentration, the pounding sounds of a roomful of weaving looms hard at work, aromas of incredible meals being prepared, camaraderie, tips and tricks from a master weaver, satisfying exhaustion after a full day of learning and weaving. That’s what Vävstuga is like. I am enjoying every minute of it. May you find something delightful to make with your hands. I’m happy for you. Those pieces are absolutely beautiful. I hope to have the opportunity to study there someday. Enjoy, and thanks for the beautiful images. I do hope you get a chance to come to Vävstuga. You won’t regret it! 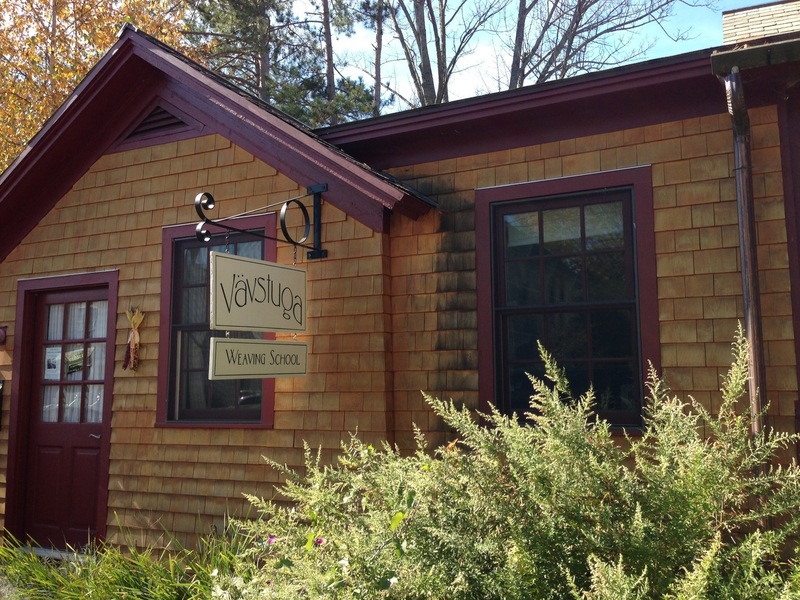 I am in Massachusetts this week for Vävstuga Classics–a weaving class. It is a beautiful time of year to be in New England. 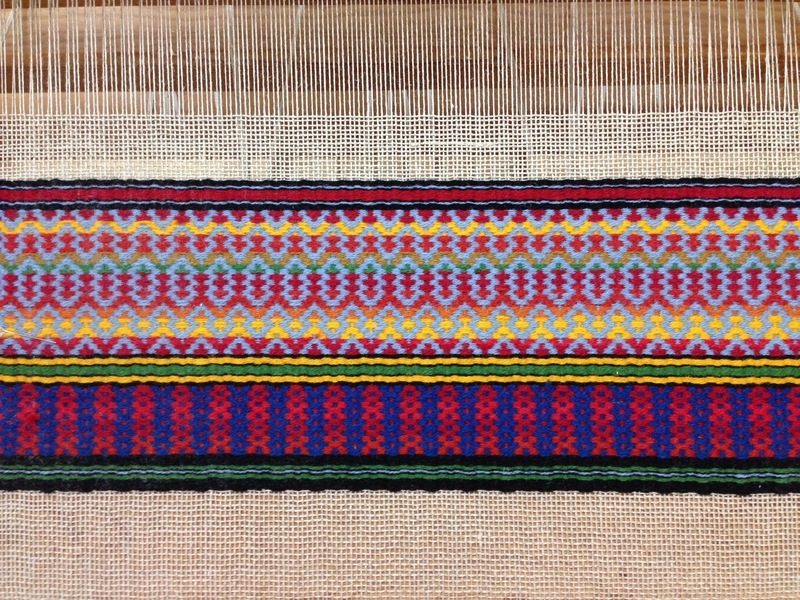 The foliage is making a show in brilliant colors–a perfect backdrop to inspire weaving. In this class we are studying in depth several classic weave structures commonly found in traditional Swedish handwoven textiles. Old and new friends, common interests, great conversations, a superb teacher. I couldn’t ask for more. 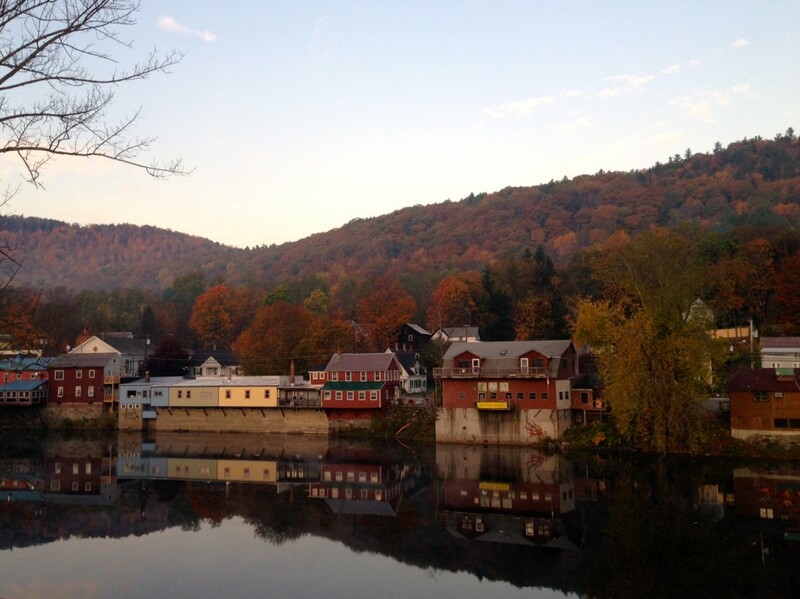 May you enjoy the scenery around you. Beautiful location, Karen! May God bless you with a colorful and encouraging time! Thanks, Bev! So far, it’s been great. lucky duck! Hope you show us what you’ve done! I’ll be happy to show you what I accomplish here. 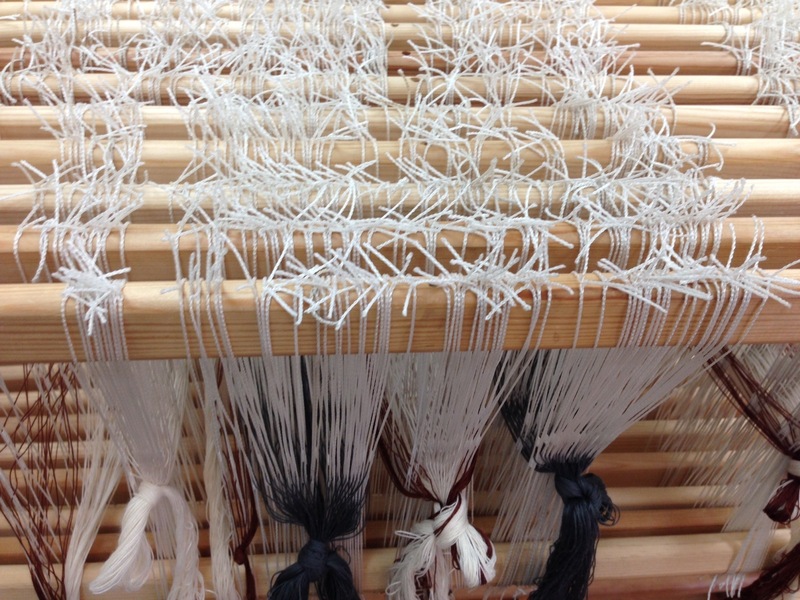 It’s exciting to see the textiles forming on the looms!